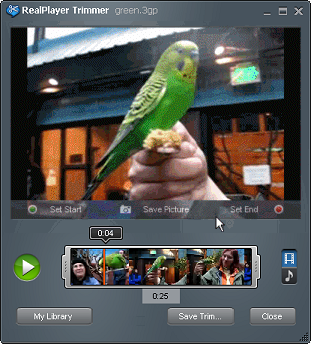 RealPlayer Trimmer lets you choose the part of an audio or video clip that is important to you. Use your mouse to drag the start and end point settings configure what part of the audio/video you want to trim. Trim and save the just the important parts of your favourite audio and video files. You can also take snapshots of frames in your video files.